Phalaenopsis orchids are one of the easiest orchids for the in home grower. Their light requirements are medium to bright without any direct sunlight. Ideal position would be two to three feet from an east or south facing window, or curtain filtered sun. It is best not to turn your phalaenopsis for even growth. Allow the foliage to grow toward the light source and cascade over the pot in one direction. Temperature range for the phalaenopsis is daytime 70F to 85F. Ideal night temperature range is 55F to 65F. In the early winter the ideal night temperature to encourage new flower spikes is 50F to 55F. 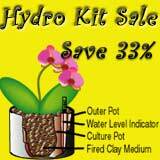 Growing your orchid in a hydroculture planter takes all the guess work out of when to water and how much. Water when there is no water left in the outside pot. Mix the nutrient solution as per packet directions. You may store the nutrient in a gallon plastic bottle to be used when ever it is time to water you plant. It is best to keep it at room temperature and out of direct sunlight. About once a month, rinse the foliage and clay pebbles under warm running water to remove any dust and accumulated plant food from the medium. Be sure to blot dry any moisture that is in the crown of the plant. Return the culture pot to the outer pot and water again with the nutrient solution. The ideal time to do this is when your plant is in need of water. You can even let it sit dry for a day before watering. This gives the root zone optimum oxygen. After you have enjoyed the first blooming cycle from your phalaaenopsis orchid you may cut the flower spike just below the bottom flower when the blooms have faded. This will encourage a branching spike and a second bloom cycle. Always use a sterile scissors or a new single edge razor to make your cut. After the second bloom cycle cut the flower spike down close to the leaves to allow the plant to regain energy before blooming again.